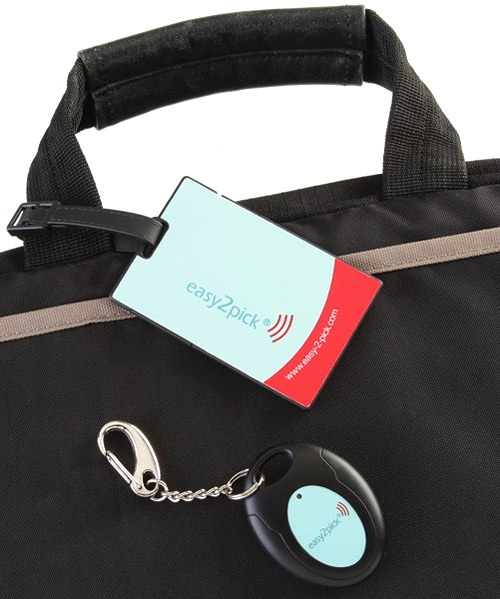 easy2pick Wireless Luggage Finder Seems Smarter Than Most | OhGizmo! By Andrew Liszewski on 03/10/11 • Leave a comment! It’s not the first contraption designed to make finding your luggage on an airport carousel easier, but the easy2pick does seem to be a bit smarter than most. It’s a combination of a luggage tag with a built-in wireless transmitter and a keychain that will sound an alarm, flash and vibrate when your suitcase is within a 66 foot range. So while it might mean that it’s not actually on the carousel just yet, you’ll know it’s coming, and at the least, you’ll know it’s in the same airport as you. Unique ID codes ensure that your keychain won’t detect someone else’s luggage tag, and the 100-hour battery life in the transmitter is prolonged even further thanks to sensors that deactivate it when it’s in the cargo hold of a plane by measuring the light, altitude and even sounds. And the system is a very reasonable $24.95 from X-treme Geek.